On our drive back from Arkansas, my grandmother and I followed my parents and sister for a little while in a car caravan. After checking out roadside attractions along our driving route, I suggested that we stop at Borroum’s Drug Store and Soda Fountain in Corinth, Mississippi, and everyone thought it was a great idea. 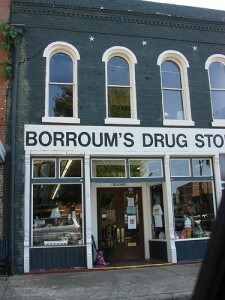 This is Mississippi’s oldest drug store and soda fountain, established in 1865. Though I’d originally intended to get something much more appropriate to a soda fountain like an ice cream sundae, I was intrigued when I saw fried hot dog on the menu. I’m a hot dog fan, but I don’t get the chance to eat them very often. This seemed like the perfect opportunity. So I ordered myself a fried hot dog and some onion rings. Grandma chose the same with potato chips. Dad ordered a slugburger (which is not what you think, but this isn’t the place for that explanation). Mom ordered a chicken salad sandwich. Sarah ordered something vegetarian with pimento cheese. That fried hot dog, sliced in half long-ways so it lay flat on the bun, covered in slaw was delicious. I don’t even like slaw, but I really enjoyed that hot dog. So this past weekend, hot dogs were on sale. Plus I had a coupon. So I picked some Oscar Mayer Classic Weiners. I know at this point a lot of you regular readers are thinking, “What??? This is someone who preaches happy, healthy living. Hot dogs aren’t healthy.” Part of what I’ve realized in my diet journey is that no one should deprive themselves completely. If you want a donut, eat a donut. Don’t say “No, I’m not allowed donuts” then begin to obsess about this food. If you have a craving, satisfy it. Better eat ONE donut now than a whole box later. Better eat that ONE donut you’re craving than try eating the “healthy” bowl of cereal, then a handful of crackers, then a popsicle, then another bowl of cereal, then a granola bar, which will all add up to the same amount of calories, if not more, than the donut. Satisfying the craving now will help you from overeating later. If I want some chocolate, I help myself to a handful of dark chocolate chips. If I want to order a steak, I can, but I’ll order the 9 oz instead of the 12. The key is to allow yourself these “bad” foods while also understanding that you cannot overdo it. You can’t eat a donut or a steak every day. I don’t eat hot dogs every day. If I haven’t had any bread in the day, I’ll allow myself one hot dog in a bun. If I need a second hot dog, then it will go bunless. I will never eat a third hot dog. (Unless I’m in a hot dog eating contest, which I’ve somehow managed to avoid at this point in my life…) If I’ve eaten bread earlier in the day, then I am only allowed bunless dogs. I don’t eat fried food every day. Our deep fryer is filled with Smart Balance Oil. I recommend any and all of the Smart Balance products, especially the milk, butter, and oils. Yeah, I might be deep frying my hot dog, but I know that this is a much healthier alternative to other oils, like vegetable or canola or lard. So I’m trying to make dinner fun. Tonight we’ll be eating something strange and silly and not at all regular for us as I try to recreate a restaurant experience in our own kitchen. I know this deep fried hot dog isn’t a recipe I’d ever flip to in the diabetic cookbook that I hold so dear. But I am not going to feel guilty about it. I’m going to satisfy the craving that I have for a hot dog, and I am going to enjoy this meal. Sometimes, you just have to have a sense of humor about what you’re eating, knowing in the back of your mind that you have made this meal the healthiest you can possibly make it and you can return to the seriousness of diet and exercise tomorrow. Like Scarlett says, tomorrow is another day. I just love the way you word things. It’s so helpful! This was very inspiring Rachel & its making me feel a lot better about my occasional dessert no more beating myself up about it! Yea, Tammy! Let’s work on living guilt-free lives! I also like to recreate recipes that I have had at restaurants. Last night we had Enchiladas de Calabasa(butternut squash enchiladas) from SEVA, a restaurant in Ann Arbor.